Whenever I say that I enjoy traveling people usually respond with “Where have you traveled?” Then when I start listing and Chicago comes up, people are always a bit surprised that it was on my list. “Why Chicago?” they ask, baffled by my life choices. I think the better question here is the ever predictive cliche: Why not Chicago? Me, I’m a simple girl. Having grown up in California, snow has always been foreign to me. I wanted to feel the crispness in the air and the spirit of Christmas everywhere. I love my California sun, but I wanted to experience Christmas in a way other than a decorated palm tree and wearing Santa hats on the beach. This might seem strange to some, but snow was an adventure in itself for me! Show me what it’s like to live like Macauley Culkin in Home Alone. However, unbeknownst to me, December is too early for snow, so I failed in that aspect of the goal setting department, but I discovered much more than snowflakes in Chicago: how to keep warm. The days and nights were cold enough for trench coats and fashionable boots to be brought out. Clothing, however, is not what kept the people warm. By day, the people walked quickly from building to building before the chill could penetrate their coats. At night, the streets were less crowded. The street lights shone bright, but I did not see any people outside. I soon discovered that my California blood did not keep me warm during these nights, and found myself opening doors to the nearest bar– where the people were hiding. Cold weather be damned. Cover the chill in the air with a blanket of whiskey. Feel it warm your insides. During my short trip, the bars I slipped into were always the warmest. Not just in temperature, but the environment. 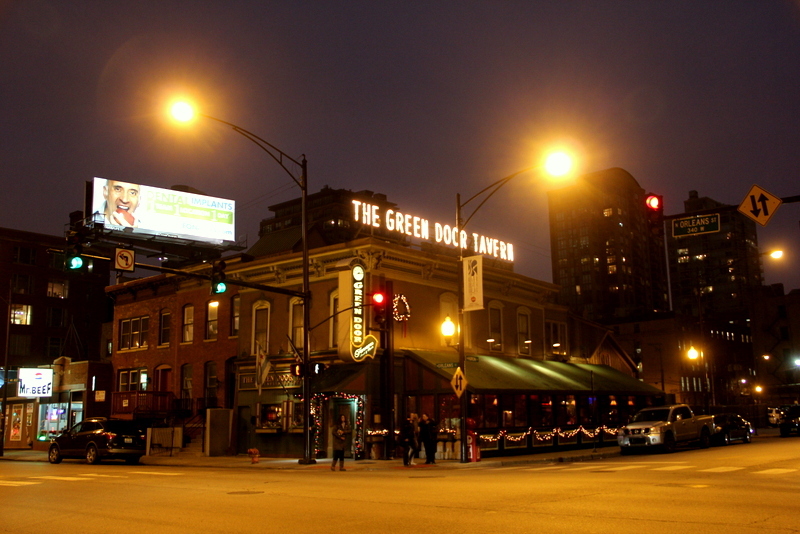 Before rushing to the train station, my friend and I stopped at The Green Door Tavern, an old bar that survived prohibition, where we grabbed a quick couple of shots and had good conversation. Another time, instead of sitting at a table at the restaurant, I opted for the bar where I was able to converse with other party-of-oners. 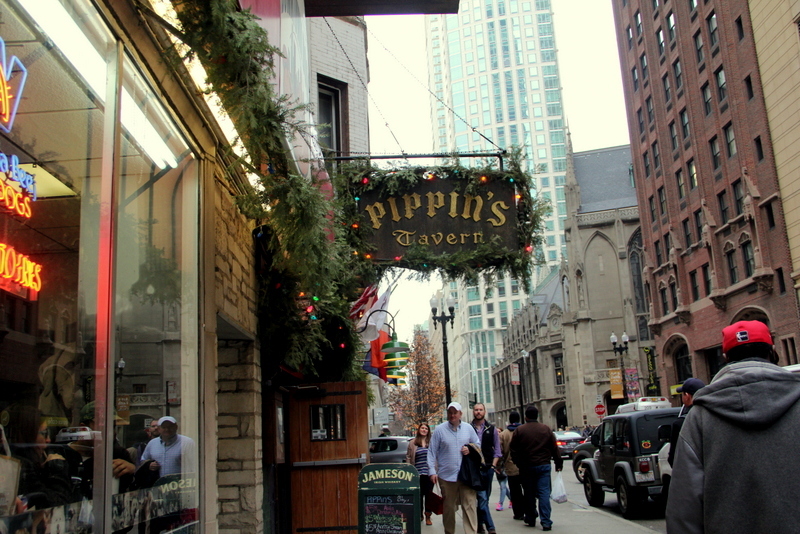 Sometimes, on my way back to my hotel I would pop into Pippin’s Tavern where I found the bartender welcoming my lonely self, once again, to a crowded bar full of friends and ordering a couple rounds of Jameson (yes, dear bartender, they are both for me…) and then enjoying conversations with friendly strangers. As soon as I opened the doors to these places I could feel the warmth given off by the bodies filling the room, forcing me to strip down to one layer of clothing. Laughter in the air inspiring enjoyment and engaging conversations.This is how you stay warm in Chicago. These weren’t big bars. These were small, close-knit bars. Not a fancy club, not some pompous, upscale wine bar, but a bar meant to feel like home. That’s why I loved being in Chicago. The weather was cold, and I didn’t get to see snowflakes but Chicago was very welcoming where the drinks were pouring and the people were talking and the fingers were snapping and… It was like jazz music: it’s random and unexpected, but also very in sync. Everyone was looking for warmth. I was a stranger looking for warmth (in all the wrong places) yet I ended up in random heart-to-hearts with people I didn’t know. Forget a hot cup of coffee. There’s nothing like a few shots and a good conversation to really get the blood pumping.